Had Georgia been a NATO nation in 2008, the U.S. could have been on the brink of war with Russia over the disputed and minuscule enclave of South Ossetia, which few Americans had ever heard of. Why would we bring Georgia into NATO now, when Tblisi still claims the breakaway provinces of South Ossetia and Abkhazia, both of which Moscow controls and defends? Are we not in enough quarrels already that could lead to new wars — with Iran in the Gulf, China in the South China Sea, North Korea, Russia in the Baltic and Black Sea, Venezuela in our own hemisphere — in addition to Iraq, Syria, Yemen, Afghanistan and Somalia where we are already fighting? Among neocon and GOP interventionists, there has also long been a vocal constituency for bringing Ukraine into NATO. Indeed, changes in the GOP platform in Cleveland on U.S. policy toward Ukraine, it was said, were evidence of Trumpian collusion with the Kremlin. But bringing Ukraine into NATO would be an even greater manifestation of madness than bringing in Georgia. Russia has annexed Crimea. She has supported pro-Russian rebels in the Donbass who seceded when the elected president they backed was ousted in the Kiev coup five years ago. Kiev’s recent attempt to enter the Sea of Azov by sailing without formal notification under the Putin-built Kerch Strait Bridge between Russia and Crimea, proved a debacle. Ukrainian sailors are still being held. Trump has rightly demanded that Europeans start paying their fair share of the cost of NATO. But a graver question than the money involved are the risks involved. 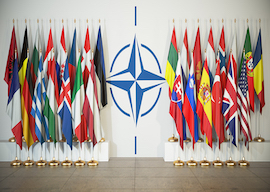 Since the end of the Cold War, NATO has added 13 nations: the Czech Republic, Slovakia, Poland, Hungary, the Baltic states of Estonia, Lithuania and Latvia, and six Balkan countries — Bulgaria, Rumania, Slovenia, Croatia, Albania and Montenegro. Also attending the NATO gathering in Tblisi a week ago were Sweden, Finland and Azerbaijan. Are these three also candidates for U.S. war guarantees? The larger NATO becomes, the further east it moves, the greater the probability of a military clash that could lead to World War III. Yet none of the nations admitted to NATO in two decades was ever regarded as worth a war with Russia by any Cold War U.S. president. When did insuring the sovereignty and borders of these nations suddenly become vital interests of the United States? And if they are not vital interests, why are we committed to go to war with a nuclear-armed Russia over them, when avoidance of such a war was the highest priority of our eight Cold War presidents? Putin’s Russia, once hopeful about a new relationship under Trump, appears to be giving up on the Americans and shifting toward China. Last week, 100 Russian troops arrived in Caracas. Whereupon, The Wall Street Journal lost it: Get them out of our “backyard.” The Monroe Doctrine demands it. Yet, who has been moving into Russia’s front yard for 20 years? As the Scotsman wrote, the greatest gift the gods can give us is to see ourselves as others see us.